Trump has set a Friday deadline for preserving the pact. Prime Minister Justin Trudeau addresses a group of businessmen in Longueuil, Que. on Aug. 28, 2018. WASHINGTON — The fresh round of U.S.-Canada negotiations on the North American Free Trade Agreement generated hopeful signals from both camps Wednesday that a deal could be struck by the end of the week. The 24-year-old NAFTA, which also includes Mexico and is integral to the continent's economy, has been under renegotiation for more than 12 months. Canadian officials say an agreement announced earlier in the week between the U.S. and Mexico, which includes common ground on the difficult issue of labour within the auto sector, has broken a logjam in the talks. Trump added a layer of urgency to the negotiations after announcing his deal Monday with Mexico — with a threat to Canada that it join their pact by Friday or suffer the consequences of punishing tariffs on its auto sector. He also warned that the U.S. and Mexico would move forward bilaterally without Canada. By Wednesday, after round-the-clock talks among officials from all three countries, a cautious Trudeau said it was possible for a new three-country treaty to come together by week's end — but he added Canada refused to be rushed into a poor deal just to meet Trump's deadline. To get to a deal, Canada is under pressure from the U.S. to compromise on key issues — from opening access to its protected dairy sector, to getting rid of NAFTA's dispute settlement system, to introducing a clause that would call for the deal to be renegotiated again every 16 years. 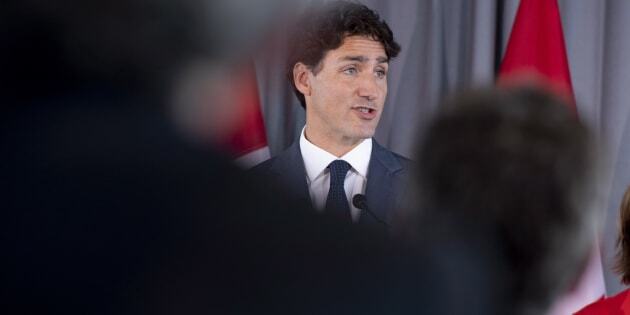 "We recognize there is a possibility of getting there by Friday, but it is only a possibility because it will hinge on whether or not there is ultimately a good deal for Canada, a good deal for Canadians," Trudeau said at an event in northern Ontario. "I've said from the beginning no NAFTA deal is better than a bad NAFTA deal. And we are going to remain firm on that principle because Canadians expect us to stand up for them." His office said the prime minister will hold a call Thursday afternoon with premiers to discuss the NAFTA negotiations. Foreign Affairs Minister Chrystia Freeland will be on the call, as will Canada's ambassador to the U.S. David MacNaughton and Dominic LeBlanc, the federal minister responsible for intergovernmental affairs. Trump, too, was confident Wednesday that a deal could be on the way. "They want to be a part of the deal and we gave until Friday and I think we're probably on track," Trump told reporters of Canada's negotiating team. "We'll see what happens. But in any event, things are working out very well." The U.S. president also noted it would be a bad idea for Canada to let this opportunity to join the U.S.-Mexican trade agreement slip away. "I think it's going to be obviously very good for Canada if they do (join) and I think it's probably not going to be good at all if they don't," Trump said. Freeland, who has been leading Ottawa's negotiating team this week in Washington, said Wednesday she was optimistic about the "intense" talks now under way in the accelerated search compromise on NAFTA. "When it comes to specific issues, we have a huge amount of work to do this week at the ministerial level and also officials are really grinding through extremely intensively," the minister said as she emerged from a meeting with her U.S. counterpart in Washington. When pressed by reporters, Freeland would not provide details of what Canada might be putting on the table, saying she and Lighthizer have agreed not to negotiate in public. Trudeau similarly refused to get into details. She credited the Mexicans for their difficult decision to compromise on labour and wages as part of its auto rules-of-origin talks with the U.S., saying it has cleared the way for more substantive talks between Washington and Ottawa. "This is a really important step for us and it has set the stage for very intensive conversations and negotiations that we're going to have this week," Freeland said after her morning meeting with U.S. Trade Representative Robert Lighthizer. For now, Canadian negotiators are primarily focused on bilateral talks with the Americans. She and Lighthizer are to meet again later Wednesday as their officials continue to negotiate. Asked to comment about how was feeling about his trading partners, Trump said Wednesday: "I love Canada. You know what?. I love Mexico too." Asked which one he likes better, he said, "I like 'em both the same."